This car is a big deal for Jaguar. 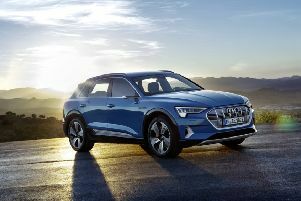 Not only does it have to take on two very popular German rivals, it also aims to boost its sales volume considerably and bring new customers into the brand. No surprise then that it’s practically 100 per cent new. n all-new aluminium and steel architecture, new engines and new suspension are wrapped in a brand-new exterior design. Inside there’s a new generation infotainment system as well as more personalisation options. Jaguar is making some big claims for the car, particularly that the most efficient diesel version can hit 99g/km. There’s a familiar air to the XE, but this is no bad thing. Look at it alongside the existing XF saloon and the resemblance is clear, but the XE is a little more compact and has a much shorter overhang at the rear. It also has the sporty look that buyers are really keen on, although models like this Portfolio have a more restrained and luxurious feel. Halo cars like the F-Type have transformed Jaguar’s image in recent years, and the XE will be trading on this in order to bring new buyers to the brand. With its smart appearance and obvious kerb appeal it should prove to be a winner from a stylistic point of view. It might be a compact saloon but the space inside the XE is generous. Up front, there’s a good view out thanks to the low-set dashboard, although the high waistline gives a welcome enclosed feeling. The seats are very supportive and offer a good range of adjustment, while head, leg and hip room are all good enough for those over six feet tall. In the rear, space is a little tighter, but there’s enough legroom to take adults comfortably. The boot is well-shaped and offers up to 455 litres of space. The cabin itself is clearly laid out and easy to use, with the new infotainment system offering attractive graphics and slick operation. Storage space is good too, although the overall design is a little more conservative than the exterior. Jaguar set itself the modest target of being the best driver’s car in the class, but it has the potential to do so. The brand-new 2.0-litre diesel engine is usefully brisk in 180PS form as long as there is 2,000rpm showing, and the six-speed manual gearbox is slick and satisfying to use. At a cruise, the engine is impressively refined, and although the noise levels go up when worked hard, it never becomes coarse or unrefined. Without doubt, however, it is the XE’s chassis that impresses most. Overall, there is clear sporting bias to the suspension set-up, but the ride quality is excellent; controlled over undulations but with no harshness even on a variety of surfaces. Yet it is beautifully balanced and free from roll when pressing on; there is excellent grip front and rear and the XE delights in hustling through bends, remaining composed and entertaining. The final ace is the steering which, although not packed with feel, is sharp without being nervous, accurate and rewarding. Keen drivers will love it; everyone else will just think it’s just right. There’s no skimping on the standard specification either. Even the base SE model comes with satellite navigation and DAB radio, 17-inch alloy wheels, cruise control and a leather steering wheel. This top-specification Portfolio comes with double-stitched leather in a choice of colours, aluminium trim, 10-way electric seats, high-specification Meridian audio system, bi-xenon headlights and 18-inch alloy wheels. There’s a great deal to love about the XE and although it wears a premium badge, it’s the kind of car that will appeal to a broad range of buyers. Executive types will love the way it drives and the sharp looks, but it’s also sufficiently spacious that a modestly-sized family could use it all the time. If you have to have a saloon, then there’s almost certainly a version to suit your tastes.